Have you jumped on the wooden pallet trend train? I haven’t made any projects myself yet…but I did rescue one pallet from certain landfill death – and it’s pink! It sits and waits patiently in our garage. As inspiration for all of us wooden pallet procrastinators, I’ve put together a fun collection of projects I found out there in cyber land, near and far. All I can say is…Wow! 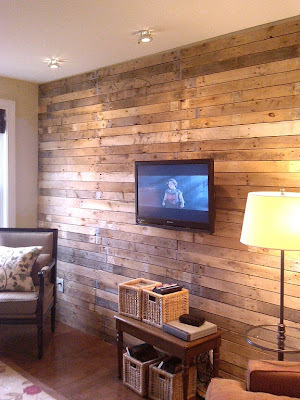 It’s amazing what people create from a pallet! Enjoy the show! Donna at Funky Junk Interiors revealed this gorgeous pallet desk just 2 months ago. How fun to think of her sitting at this desk writing her blog every day. Every good desk deserves an equally good pallet chair. How about this one from Studiomama? She also gives us the recliner version! If your little person at home needs a special place of their own, and you are short on space, take a look at this pallet wall shelving unit with built in desk from It’s Cold Outside. Got the desk covered, but still need a shelf? Ana White provides you with a tutorial to make your very own pallet shelf. Simple and effective! Or line up three in a row for a perfectly balanced rustic wall display like Hometown Girl shows us in this Pinterest photo. Take it one step further like the folks at Relic Design and rework them into a free-standing shelving unit. Rework them again for a custom design that will house your child’s growing reading collection. Claire at Madame Fancy Pants shows how at the Design Sponge site. If you aren’t in the mood to rework anything, simply turn over that crate and hang it on the wall like at Katrin Arens’ home. You can check out other unique products at her website. So are these storage shelves in this restaurant. Just cut in half (lengthwise), stack, and fill! …or advance directly to an entire wall. Katy at Mom and Her Drill takes you through the project step-by-step. 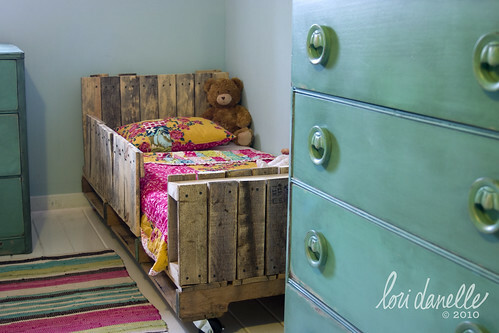 You can always skip the pallet wall and create a snuggly little sleeper bed for your little people at home like this one from Lori Danelle. Stylizimo also shows us that it doesn’t take much to create a stylish rustic headboard for the grown-ups. Here in Scandinavia, whitewashed furniture is all the rage, and this little pallet coffee table certainly fits the bill! But don’t forget the lighting! Studiomama strikes again! I-Beam Design is taking it one step further. They believe wooden pallets are a great solution for storm victims or refugee housing. There’s no reason you can’t adapt this for a nice shady spot in your garden. Or…..what do you think about this!? The Infiniski Manefesto House is designed for sustainable living. You’ll need artwork to fill that unique house of yours. How about a portrait like this one from Pallet Project? Or this typography art from Media Bistro. Of course you’ll need something to hang on the door at Christmas, and I found the perfect wreath from Aaron at Nouveau Classics as featured on Apartment Therapy. And I’m already trying to figure out how to build one of these holiday beauties for my house this year. Wouldn’t this be divine in the front yard with twinkle lights? And finally, there is always the real thing from Burning Art...and the irony of wood being repurposed to build a tree is not lost on me! So you see? 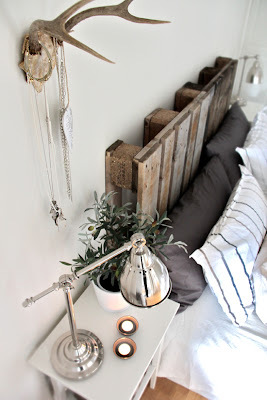 The possibilities of how to use your wooden pallets are endless! All you need is a dash of imagination and the desire to save the world…one- ‘wooden pallet rescued from a landfill life’ at-a-time. Check out my Wooden Pallet inspiration board on Pinterest. UPDATE: There has been LOTS of debate as to the use of pallets for interior design. Here’s an article from Curbly (Oct 2011) that highlights the subject. It’s an interesting read – including the comments below the article. Have a look, and decide for yourself if you are for-or-against the idea. Pat-tay – You're more than welcome! This is a fantastic post! Amazed and totally intrigued by all of the projects. Now, I'll have to go out and search for pallets. I love pallets! I sometimes think there's something wrong with me that I love finding uses for all those throw-aways, ugh! But I see there's a lot more like me than my husband would like to know about, Ha! These projects are GREAT! I use pallets for my hand made kitty condo's to sit on so they're off the cold ground, but boy do I have some good ideas for them now. Thanks. Awesome ideas! Very creative and unique. Thanks for the inspiration. What great ideas! We have pallets readily available – now I Know what to do with them!! Hi! I don't want to be a bummer, but be very careful; pallets that are use for internationnal shipping are spray with insecticide and other crap for the sea-ride.. check from where they come from before..let's say thinking about doing a bed frame on the cheap for your kid..yanno! love the wooden book shelf and toddler bed! they are awesome! Ashapura Saw Mill is one of the leading reputed manufacturers, suppliers and exporters of Wood packaging products, wooden storage Boxes, Wooden packing crates, Plywood Boxes and other wooden packaging solutions. They customize Heavy Duty wooden packaging solutions as per client’s requirement. I rescued several of them to make the many crates that helped us move from the States to Sweden, from Sweden to the States and again from the States to Sweden. They are hand little things! That little toddler bed is too cute. I read once that pallets are treated with chemicals though. I don't know how to verify that. If it is true I don't think I'd want to make anything for indoor use out of them. Have you come across anything about that? I have given you an award! Congratulations!